A name associated with what collectors refer to as elegant glass, but not quite as well known as the big three - Fostoria, Heisey and Cambridge - is Duncan and Miller Glass Company (usually abbreviated Duncan-Miller). This company produced some really beautiful patterns and cleverly designed pieces back in its day. Even the colors used by Duncan-Miller compare to those seen in similar Cambridge and Fostoria dinnerware sets. Duncan-Miller actually produced the glassware collectors most often associate with the company between 1893 and 1955. The founder, George Duncan, was associated with the glass industry a number of years before he opened the business in 1872. The Pittsburgh factory employed many immigrant laborers who brought skills learned in the finest European glass factories with them to the United States, and this certainly shows in the quality of this company’s wares. Ernest Miller, who made partner in the organization in 1900, actually joined the firm in 1874. He devoted more than 50 years to designing and overseeing the production of beautiful glassware products, according to The National Duncan Glass Society. The Duncan family not only owned the business, but the descendants of George Duncan operated the company until it closed in 1955. At that time, the molds, machinery and equipment were sold to United States Glass Co. headquartered in Tiffin, Ohio and used to produce the later Duncan-ware lines. Some of Duncan-Miller’s earliest products fall into the pattern glass category. Pattern glass usually has a rather ornate design, or pattern, pressed into the glass. While pattern glass is collectible in its own right, and has a good following in the collecting world, it is much thicker and generally heavier in weight than elegant glass. Collectors usually recognize elegant glass as having a smooth surface and decorative patterns etched into the glass rather than molded. Of course, there are exceptions. Some lines categorized as elegant glass do feature molded patterns including one of Duncan-Miller’s most popular: Caribbean. With a wavy design reminiscent of ocean swells and the most popular color being a pretty light blue, this particular Duncan-Miller design justifies its moniker. Caribbean was also produced in clear, or crystal, along with amber and red in more limited quantities. 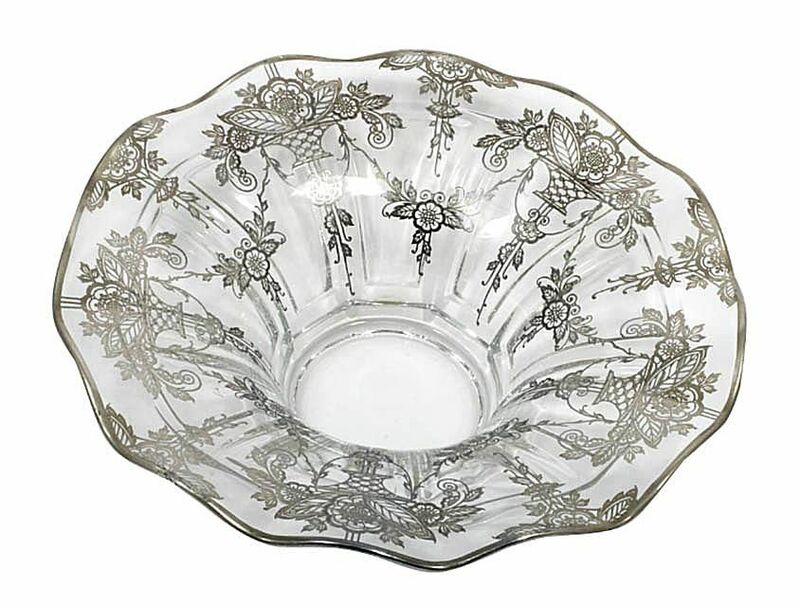 Like the other popular elegant glass manufacturers, Duncan-Miller also made different mold lines, which are more commonly referred to as “blanks.” Sometimes Duncan-Miller’s blanks were sold as a stand-alone pattern such as the simple yet stylishly scalloped Canterbury, or the squarely modern Terrace patterns. These can even be decorated with intricate silver overlay as shown here on a Whitney blank. When etching was added, however, the name associated with the pieces usually corresponds with the etch rather than the blank. In Duncan-Miller’s case, the popular First Love pattern can be used as a prime example. Although the First Love etching was used on many different blanks, shoppers still refer to it as First Love when seeking pieces for a collection. If they want to get really specific in matching up a set of dinnerware, for example, they may seek First Love etching on Canterbury blanks. Yes, it can be a little confusing at first, but the more you examine and learn about elegant glass, the easier it becomes to recognize pattern names and blank styles including those made by Duncan-Miller. A good all around reference on elegant glass is Elegant Glassware of the Depression Era by Gene Florence for Collector Books (now out of print but available through used booksellers). Duncan-Miller falls into the “others” category in this price guide, but the company isn’t entirely overlooked. If you’re well versed in the big names in elegant glass and want more information on Duncan-Miller specifically, look up Depression Era Glass by Duncan by Leslie Pina, PhD. You’ll find this to be a well-researched book with enough photographs to keep you happily studying Duncan-Miller glass for quite some time.